In troubled and hectic times like this, city dwellers can find their peace of mind in music - and we are glad that this soundtrack album to India-born director Mira Nair’s movie does a good job of soothing our bothered minds. 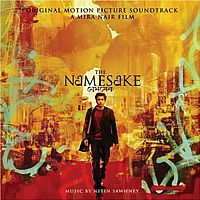 The 55-minute album contains both score material and tunes which appear in the touching movie about the clash of modernity and traditions in an Indian family. Acclaimed flamenco guitarist Nitin Sawhney provides 26 minutes of underscore here, featuring traditional instruments like flutes, sitars and tablas. Being listeners living on this side of the globe, the Asian sounds are not foreign to our ears. There may be no outstanding main theme to identify in Sawhney’s works, but the brief melodies seem to flit about with such lyricism, your nerves would be calmed by their mesmerizing effects. Interspersing these score tracks are traditional chants and modern raps. A personal favourite is 1960s Indian vocalist’s performance of “Jhiri Jhiri Choyetali”. The 3-minute Bengali tune evokes charming pictures of pretty Indian dancers tapping to the music in their gorgeous saris. Elsewhere, there are hip-hop tunes like “Flight IC408” which got us chuckling to the airplane crew’s announcements; and also “Postales”, which got us chuckling to a mental image of how part animals would dance to this groovy tune. When the album closes with “Falling”, a fitting collaboration between Sawhney and English singer-songwriter Matt Hales, you’d feel the power of globalization and how it has brought people together musically.